To support sales to Turkey and the Middle East, Dutch Plantin will visit these markets more often. 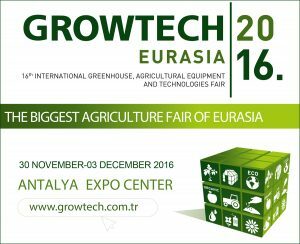 For example, between the 30th of November and the 3rd of December, we will join the Growtech Eurasia 2016 in Antalya, together with the Netherlands Export Combination (NEC). You are welcome to meet Wim Roosen at the Holland Pavilion to discuss the opportunities of cocopeat in all kind of crops.